Germany 0-1 Spain. The chokers are no more. In a hard-fought but dominated battle in Vienna, La Selección wiped all of their historical fears and under-achieving inhibitions away: one swift movement (as swift as Fernando Torres‘s run behind Philipp Lahm, and swifter than his finishing touch over Jens Lehmann) to swipe the European Cup right from under Germany’s nose. A nose which was missing the essential contribution of their team captain tonight, an unrecognizable Michael Ballack who had opted to play -poorly- despite his recent muscular problems. However one has to wonder, whether even an in-form Ballack could have stopped Spain’s asphyxiating ball possession, superior technical display, and rendez-vous with destiny. At the end of the night and 44 years after José Villalonga, Luis Aragonés became the second Spanish manager to lead La Furia Roja to an European title win. 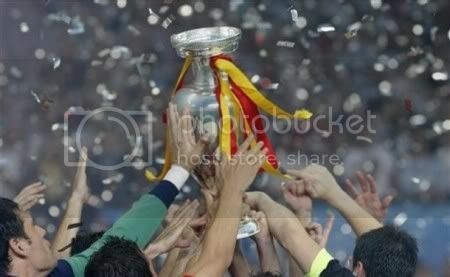 A title which, considering this month’s tournament as a whole, Spain deserved to win more than any other. ¡Viva España! indeed. Note: I apologize for the lack of updates since Sunday. I’ve been on the move, getting ready to leave for 3 weeks’ vacation in Southern Italy and things have been very hectic. I’m currently in Italy now making final preparations, but expect the number of weekly articles to drop considerably during the month of July. I’ll still drop by to say hello though. Euro 2008 gave its final verdict on Sunday night, and it fulfilled all expectations of style and betting odds: Spain beat Germany 1-0, thus earning their second ever European title after their 1964 triumph. Among the protagonists of the match a name stood above all others, namely a certain Fernando Torres who, by scoring in minute 33, became the match’s “pichichi” of sorts and a hero in the entire Iberian peninsula. Germany started the match well but quickly disappeared, unable of withstand the invincible power of Luis Aragonés’s men. Germany vs. Spain was a battle of playing styles, pressuring down the wings for the former and asphyxiating ball possession (almost to the point of nausea) for the latter, but it was also a battle of tactical choices. Those forced upon managers Joachim Löw and Luis Aragonés, being forced to deal with key injuries and to ponder on the alternatives. For the Nationalmannschaft, those doubts revolved around captain Michael Ballack (dealing with some muscular problems) and Thorsten Frings (suffering from a broken rib), both essential elements in the German chessboard. In the end, Löw decided to take the risk and fielded them both from the start. For La Selección, the real mind-scratcher was David Villa‘s absence: who was to replace Spain’s topscorer in the competition and more importantly, would he be able to do so with the same efficiency? Eventually, coach Aragonés decided to put his faith in young Arsenal midfielder Cesc Fàbregas, thus reverting his tactics to a one-striker (Torres) formation. Doubts regarding Villa’s replacement must still have been rambling the Spanish minds however, because the start of the match was all in favour of Germany. 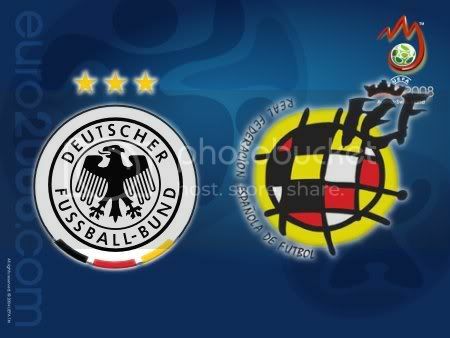 Successful in cutting down the short passing game of their opponents, the Nationalmannschaft was exploiting the initial “fear” of the Spaniards by playing simple, direct football and it worked. In minute 3, a mistake by Sergio Ramos set up Miroslav Klose for a good chance, but Carles Puyol intervened just at the right time to defuse the situation. 6 minutes later Klose was once again at the heart of the action, setting up Hitzlsperger for a mid-range effort… wide. It was quite evident by now that Spain were having a tough time: Carlos Marchena was getting dizzy from all the 18-yard box action, all the while Philipp Lahm and Lukas Podolski were having a field day on the left wing, overlapping their runs to perfection. It was time for the boys in red to wake up and sound the charge. Andrés Iniesta decided to do just that in minute 14, as he got through on Germany’s left-wing and almost caused Christoph Metzelder to score an own goal. 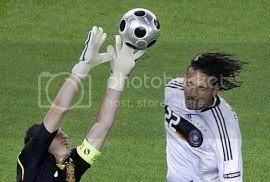 Jens Lehmann was vigilant. It was however the reaction Spain needed, and slowly (but surely) the balance of play shifted back in favor of Aragonés’s men. Efforts down the wings notably doubled in efficiency, particularly thanks to the pinpoint crossing accuracy of the players involved. In minute 23, Sergio Ramos delivered from the right side and found Fernando Torres on the second post, ready for a jumping header… onto the post! A great chance for Spain, followed just a second later by Capdevila’s follow-up effort… wide. 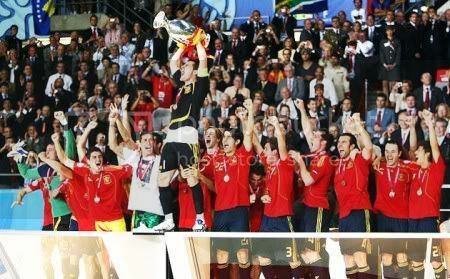 Spain were back in command and loving it. They undoubdtedly would love it even more in minute 33, when Fernando Torres got behind another good pass (low on the ground this time) and did not fail. Receiving from Fàbregas about 10-15 meters past the midfield line, the Liverpool striker burnt his marker (Lahm) with a burst of speed and finished with a delicate touch over the rushing-out keeper. 1-0 Spain. Spain could have doubled their lead shortly after, but David Silva wasted a very good chance (served to him on a platter by Iniesta) with a rather difficult one-time volley. Numbers spoke very clearly however: Spain’s midfield line was making mincemeat of their German counterparts, and the slowness of the two central-backs (Metzelder and Mertesacker) was becoming all to apparent. As for Lahm, he may have provided the winning goal vs. Turkey but he was at fault on at least two of the Turkish tallies, and seemed in no better comfort in today’s match. It wasn’t too surprising to see him go at the end of the first half (on came Jansen). Unfortunately for Germany, the substitution didn’t upset the match balance a whole lot and Spain unavoidably and relentlessly continued to press forward. Between minutes and 53 and 55, La Roja obtained three back-to-back chances (Xavi, Silva, Torres) that could have virtually put the game on ice, but lacked in accuracy or luck. Löw tried to instill some life in his team’s attack, substituting Hitzlsperger with Kevin Kuranyi, and it almost seemed to work: in minute 60, Michael Ballack (finally making a “real” appearance in this game) got behind a volley just inches wide of the post. Signs the Germans were still alive. Aragonés decided to go for safety, and replaced Fabregas’s playmaking with the interdiction ability of Xabi Alonso (shortly followed by Cazorla on for Silva). Ironically though, it was Spain once again to get very close to goal nº2, as Sergio Ramos slammed a powerful 67th minute diving header onto the crossbar and minutes later, a timely goal-line intervention of Frings prevented Iniesta’s howitzer from sending Spain into delirium. More changes ensued (Dani Güiza and Mario Gomez for Torres and Klose) and more chances for Spain on the counter: Marcos Senna was just one step too late to convert Güiza’s redirected header… the goal was wide open. Fortunately for the boys in red, that chance would not come back to haunt them. Spain continued showcasing their mastery in ball possession, raising the “olé”s from the crowd and waiting for referee Roberto Rosetti (the only trace of Italy in the European final) to call full time. When that moment arrived, an entire nation could celebrate the break of a 44 year-long fast and start the “fiesta” all-nighter: Spain were champions of Euro 2008! GERMANY (4-2-3-1): Lehmann – Friedrich, Mertesacker, Metzelder, Lahm (46’ Jansen) – Frings, Hitzlsperger (58’ Kuranyi) – Schweinsteiger, Ballack, Podolski – Klose (79’ Gomez). (bench: Enke, Adler, Fritz, Westermann, Rolfes, Neuville, Trochowski, Borowski, Odonkor). Coach: Löw. SPAIN (4-1-4-1): Casillas – Sergio Ramos, Marchena, Puyol, Capdevila – Senna – Iniesta, Xavi, Fàbregas (63’ Xabi Alonso), Silva (66’ Cazorla) – F.Torres (88’ Güiza). (bench: Palop, Reina, Albiol, Navarro, Sergio Garçia, Arbeloa, Juanito, Villa, De la Red). Coach: Aragones. This entry was posted on Thursday, July 3rd, 2008 at 9:04 am	and is filed under Euro 2008, German Bundesliga, Spanish Liga. You can follow any responses to this entry through the RSS 2.0 feed. Both comments and pings are currently closed.